When it comes to pollution, there's no city in the country that does as bad as Ludhiana. Though the World Health Organisation (WHO) established Ludhiana as the most polluted city in the country last year, little has bee done to shed this tag. Even as the Punjab Pollution Control Board (PPCB) has been making efforts to check the increasing pollution levels in the city, it is still one of the most polluted cities in the country. At present, the PPCB has set up monitoring stations to record air pollution in four parts of the city at Vishwakarma Chowk, Nahar Spinning Mills, Bharat Nagar Chowk and Verka Milk Plant on Ferozepur Road. 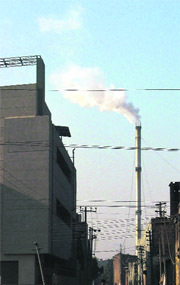 According to the National Ambient Air Quality Standards, ideally the atmosphere must not contain more than 20 micrograms of Respirable Suspended Particulate Matter (RSPM) per cubic metre, 80 micrograms of oxides of nitrogen (NOx) per cubic metre and 80 microgram of sulphur dioxide (SO2) per metre. The data collected by the PPCB shows that the highest average RSPM is at Vishwakarma Chowk (250.75 microgram/m3), followed by Nahar Spinning Mills (244.25 microgram/ m3), Verka Milk Plant (219.875 microgram/m3) and Bharat Nagar Chowk (192.125 microgram/m3). All these are more than double the permissible limit. In October last year, the PPCB had studied the contribution of vehicles in air pollution in the city and had earmarked five most traffic prone areas, including Bharat Nagar Chowk, Jagraon Bridge, Bus Stand, Samrala Chowk and Dholewal Chowk. The experts took samples of RSPM, sulphur dioxide and oxides of nitrogen. 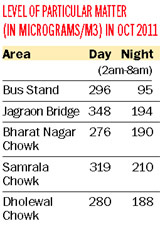 The Jagraon Bridge area was found to be one of the most polluted part of the city where 348 microgram/m3 of air was found to be polluted during day time, three time more than the permissible limit. Krunesh Garg, senior environmental engineer, PPCB, told The Tribune that the levels of RSPM were higher as a lot of construction activity was on in the city. "Besides, the city roads are not swept properly due to which the dust particles get calculated in our monitoring stations. Moreover, thousands of new vehicles are added to the city roads every month, which also leads to the increased pollution levels," he claimed. 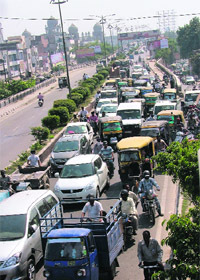 The already congested roads in the industrial city will have to bear more burden as over 59,661 vehicles (both two-wheelers and four-wheelers) have been purchased in the past six months. 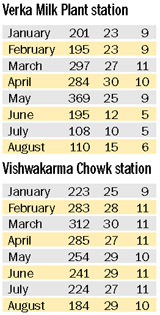 With this, the total number of vehicles plying in the city has crossed the 13-lakh mark. The number, however, does not include the old vehicles. Divulging details, District Transport Officer MS Chatwal said, "We have already issued numbers to 130 series, this does not account for the old vehicles. 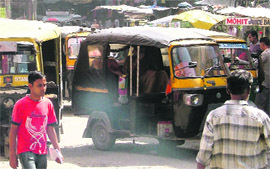 But adhering to the High Court's orders, we are now not issuing permits to three-wheelers," said Chatwal. The "cash-rich" society in Ludhiana, without giving a second thought to the alarming levels of pollution generated through the vehicles, seems to be buying a separate vehicle for each member of a family. Geetinder Kaur (name changed), a homemaker at BRS Nagar, lamented, "Residents believe in "show-off" culture and are imbibing "hollow" values in younger generations. "From our area, about six children go to the same school. I have asked two to three families to go in for car pooling. The traffic problem, particularly, outside the school can be taken care of. But none gave me a positive reply, instead they started looking at me as if I had committed some crime. One of the mothers said that her child was in the habit of coming with a maid, he will not be comfortable in a pooled car with so many children, I was taken aback," said Geetinder Kaur. The growing vehicular traffic and industrialisation is taking a toll on the health of traffic policemen. The officials, who are deputed at key intersections, including Samrala Chowk, Sherpur Chowk, Jagraon bridge, Bharat Nagar Chowk and Jalandhar bypass, are not only inhaling poisonous fumes emitted by vehicles, but are also braving dust. A medical check-up of the officials conducted recently put the department in a fix. It is learnt that a majority of the officials are suffering from respiratory deceases like bronchitis and asthma. Skin diseases have also become common among them. “We are made to stand under the scorching sun to regulate traffic. I know how my white uniform turns black by the evening due to pollution. You can well imagine what would be happening to my lungs,” said a traffic policeman deputed at the Jagraon bridge. The police department has proposed to develop cubicles for the officials where they can sit for a breather. However, the plan has not materialised so far. The police has also introduced a mask which is helpful in preventing pollution, but the officials find it irritating and do not wear it. There have been allegations that greed to earn a quick buck is also a cause that the traffic policemen do not opt for a transfer and spend their entire service by standing at a particular roundabout. Some of the roundabouts of the city are considered money churners as the officials get a "bribe" for not fining violators. "Air pollution affects the respiratory system. I have been practising in the city for the past eight years and have seen that the number of patients suffering from lung cancer has increased 1.5 times. Not only the lung cancer, but diseases related to respiratory tract are also on the rise," said Dr Devinder Singh Sandhu, cancer specialist.Professor in the ENT department of Dayanand Medical College and Hospital Dr Munish Munjal said noise pollution resulted in hearing impairment. He said, "Exposure to 50 to 80 decibels of sound can speed up ageing process." High noise levels can be harmful for health. DR Munjal said,"My wife, who is a gynaecologist, conducted a research about five years ago the on effect of noise pollution on pregnant women and found that due to noise pollution chances of miscarriage are always there." He added, "As far as the effect of air pollution is concerned, it leads to nasal discharge, nasal itching, choking of throat, breathlessness and in many cases, people become asthmatic too." Sham Singh Harika, chairman of the Road Safety Minded Citizen's Council, said,''Pressure horns are very harmful, especially for pregnant women. Such horns should be banned by the government and the violators should be penalised." Corporate houses and industry should be the main crusaders for preserving environment, but the fact is that they are busy earning money and have no time for taking up environmental issues. Plantation drives are a mere show off and nobody takes care of these saplings. "The big corporate houses should undertake the responsibility of making the city green, but the spirit lacks in them. In metros, some of the malls have started a green drive and have planted saplings in front of the malls, but the city's malls have failed to take the plunge," said Harneet Arora, a student. If we look at the number of the plantation drives carried out in the city, Ludhiana would have been a greener place to live today, but since these drives are just a show off, the situation of the industrial city remains the same. "Trees are being axed to give way to plush malls and showrooms, but nobody spares a minute to plant even a single sapling. Everybody should morally understand their responsibility and make city green before it is too late," added Sukhdev Singh, a senior citizen. The city is grappling with the problem of air pollution. There, however, is a silver lining as a few people, aware and inspired, are riding a different lane. Some of the people in the city have taken to cycling instead of taking out their cars and two-wheelers every time they step out of their home. "A lot depends on inspiring and educating people,"says Dr Sumir Gandhi, professor and head, oral and maxillofacial surgery, Christian Medical College and Hospital. "I got inspired from a fellow doctor to take to cycling. Seeing me, a friend of mine has bought a bicycle. It took decades for people to turn to motorbikes and cars from bicycles, and it would take time, for the reversal of trends. But what we need is to inspire and educate others," he says. Talking about acceptance to riding bicycle among people in general, he says although, not many people came to ask me why I ride a bicycle, but one should do what one feels is right. A number of senior doctors at the CMC use bicycles, he adds. Dr Deepak Bhatti, professor, plastic surgery, CMC, says "Riding a bicycle in Ludhiana, is by no means a slow means of transport, going by the traffic in the city. Although, one has to get used to it, but once you are comfortable, cycling should be preferred." The rising pollution has left the youth of the city worried. Being brought up in one of the most polluted cities of the world, their health is going to suffer in years to come, if the city continues to bristle with the rising pollution levels. A lot of them are confounded by the lack of attention being paid by society and Administration towards the alarming situation. Public transport should be encouraged and bicycles should be preferred. Bird species have disappeared over the years. Why should we be deprived of simple pleasures and clean air and nature for the fault of people and industry? As many as 171 forest guards, including 43 women, were inducted in the forest department following a three-month training today. HS Gujral, Principal Chief Conservator, Forest, while presiding over the passing out function organised at Punjab Agriculture University (PAU), told the newly inducted forest guards to do their duty with utmost honesty. Gujral said the newly recruited forest guards would play a major in increasing the green cover of the state. While handing over an award to Navjot Kaur and Eesh Puri, who stood first in the training session of the forest guards, Gujral said saving environment was an important duty and he expected that the newly recruited forest guards would do their job sincerely. He said the government had launched a Punjab Green Mission for a greener tomorrow. He said the Punjab Green Mission could not be a success without the active involvement of the newly recruited forest guards. Gujral said the Chief Minister had formulated a project of Rs 1,900 crore under which the forest land of the state would be increased in eight years. The city should have been an alcove of greenery by now if the plantation initiatives of VIPs, particularly politicians cutting across the party lines, had reached their logical conclusion i.e. if the saplings had grown to be trees. However, in most cases the saplings, once planted, become a forgotten story. With hardly any follow-up care and maintenance, the saplings are at the mercy of nature. Planting saplings is one of the easiest ways to show your concern for ecology. It is fashionable and it also provides the VIPs a good photo opportunity, says a college principal. "A sapling is planted (by the VIPs) with much fanfare. After that, it's no one's baby. If it survives, it's a miracle and if it does not, it paves the way for yet more saplings," adds the principal. "The act of planting a sapling assumes an overweening importance. The idea behind it is relegated to the backseat. No wonder, the saplings shrivel up and the drive withers away," says ex-Army officer Amarjeet Batth. Last October, five saplings at Government College for Women were damaged while making preparations for "Virasati Mela Dheeyan Da". MP Harsimrat Kaur Badal was the chief guest on the occasion. A day after Mayor Harcharan Singh Gohalwaria’s conducted a surprise check at the Ludhiana Municipal Corporation’s Zone A office, Zonal Commissioner Kamlesh Bansal visited the health branch and the operations and maintenance (O&M) branch of the MC this morning and found 10 employees absent from duty. The Zonal Commissioner had issued show-cause notices to the absentees. This surprise check was conducted in ward numbers 1, 23, 26 and 32 of the city. Four safai karamcharis and four sewer men were found absent in ward number 32 and ward number 26, respectively. Two sewer men were not on duty in ward number 23. As per rules, the working hours of safai karamcharis and sewer men are from 6 am to 11 am and from 2 pm to 5 pm. Talking to The Tribune, Zonal Commissioner Kamlesh Bansal said that four safai karamcharis out of a total of 64 in ward number 32, four sewer men out of 10 in ward number 26 and two sewer men out of eight in ward number 23 were found absent from duty. “I have issued a show-cause notice to all those found absent from duty and have asked them to reply in writing the reason of their absence and why no action should be taken against them,” he added. It is learnt that the number of absentees could have been more, but once the surprise check started, the safai karamcharis and sewermen in other wards of the city were alerted by their colleagues and soon they reported on duty. Bansal also confirmed that the safai karamcharis and sewer men in other wards might have been alerted. “But such surprise checks will continue in coming days as well,” he stated. When Mayor Harcharan Singh Gohalwaria had conducted a surprise check at the Zone-A office and only 20 out of the 100-odd employees were present at 9 am on Monday. Adhering to the Punjab and Haryana High Court orders issued on July 10, notices have been served on illegal occupants to vacate flats allotted to danga peerats in Dugri by October 5. The Sub-Divisional Magistrate (West) has been asked to get the flats vacated from illegal occupants and to handover the possession of these flats to PUDA authorities. Besides, the Commissioner of Police has been asked to provide necessary force, including policewomen, to vacate the flats. The government had allotted hundreds of flats to danga peerats a few years ago. A writ petition was filed in the Punjab and Haryana High Court in 2011 stating that 20 flats were illegally occupied families were not danga peerats. The original allottees were denied possession of flats. In July, the High Court had issued directions to the Deputy Commissioner and Commissioner of Police, Ludhiana, to get the flats vacated from illegal occupants within two months. Against the High Court's decision, four of the present occupants (out of 20) recently filed a writ petition in the Supreme Court following which the court issued directions not to get the premises vacated from these petitioners. However, other 16 flats will have to be vacated following the High Court orders. A majority of these 20 flats have been converted into mobile phone shops, footwear shops and restaurants, while some are still locked. Officials, including the SDM (West), the Additional Chief Administrator, PUDA, and the Circle Revenue Officers of East, West, Central zones, Raikot and Payal have been asked to be present to implement the High Court orders on October 5. The “Joy of Giving Week” that commenced on Gandhi Jayanti was celebrated by city-based non-governmental organisations today. Office-bearers and members of Young Indians’ (Yi) Ludhiana Chapter, a non-governmental organisation, celebrated the "Joy of Giving Week" with the children admitted to the paediatric and thalassemia ward at Dayanand Medical College and Hospital here today. The children were amazed to see their wards being decorated with colourful balloons and frills. A cake-cutting ceremony was also organised. Yi members also gave some board games to the staff in charge of the ward for the children to play. Gaurav Munjal, chair of the city chapter, informed that the “Joy of Giving Week” was launched in 2009 from October 2 to 8, to bring together Indians from all walks of life in celebrating the "giving” of useful things to the underprivileged people. Dr Praveen Sobti, professor of paediatrics, said Ludhiana was in need of such kind of organisations engaged in community service. Another city-based NGO, Voice of Youth Foundation, celebrated the occasion by distributing clothes and items of daily needs to underprivileged families living in shanties. NGO president Prem Grover also made them aware of dengue fever that is spreading in the city and gave them tips to prevent the disease. He advised the people to rush to a doctor in the initial stages to avoid further complications. He also stressed on the need to live in hygienic conditions. Grover appealed to the pubic to come forward to help poor people during this week and feel the “joy of giving”. Animal Welfare Day will be celebrated across the world tomorrow. However, the gloomy picture of animal care and welfare in the city comes to light on seeing the condition of stray animals. The condition of stray dogs in the city is particularly dismal, as these animals are maltreated and considered a menace. On the one hand, they suffer from diseases due to callousness of the Administration that fails to provide proper vaccination and sterilisation, and on the other hand from apathetic attitude of the people, says Poonam Kalra of Hope an NGO. There are no shelters where stray dogs can be kept and cured. Although there are so many gaushalas in the city, none of them have a single shelter for stray dogs, she says. Even veterinary doctors hesitate from treating stray dogs, she says. “In fact, a few people who do take initiative for the improvement of the condition of these canines get overburdened and eventually give up on getting no financial aid or facilities from the Administration,” she says. Kalra says that the initiatives like sterilisation and vaccination should be carried out on a war footing. “Things would only improve if proactive measures are taken to take care of the animals; otherwise, it won't take long for our streets to be overrun by stray animals. This would also lead to a backlash on these poor animals. Proper steps should be taken for controlling their population and deal with the problem in a more humane manner,” she says. Christian Medical College and Hospital has appealed to the public to help a critically ill patient who is undergoing treatment at the hospital. According to a hospital release, the patient, Arvind Kumar, has been diagnosed with an infection of the skull. He is a daily wager. If a woman suffers from breast cancer, her first-order female relatives are more susceptible to the ailment as compared to the other women. Moreover, if two females of a family suffer from the cancer, the susceptibility increases much further for the other female relatives. This observation was made by Dr Raman Arora, senior oncologist of Mohandai Oswal Hospital, where a month-long breast cancer awareness camp was inaugurated today. The hospital has come forward for this noble cause to make women aware of breast cancer and conduct free screening as a part of International Breast Cancer Awareness Month. Principal of Tara Singh Memorial College Dr Parveen Chawla, who inaugurated the camp, insisted that the self breast examination was the best way to prevent the cancer. Other experts of the hospital also gave presentations and shared views on the ailment. According to Dr Arora, as the age of puberty as well as menopause had advanced, female hormones remained active for a longer time. This could be one reason for the increase in the number of breast cancer cases, he said. According to the roll of honour of the College of Agriculture, Punjab Agricultural University, girls are dominating the various academic programmes being offered at the college. During the last 17 years, for only three years boys figured in the roll of honour, whereas for the remaining 14 years, girls made it to the roll of honour for their overall performance. PAU Vice-Chancellor Dr Baldev Singh Dhillon says that even he is surprised to see the poor performance of the boys for the last several years. Himself an alumnus of the university, Dr Dhillon says that when he was studying at the university, very few girls used to enroll to the agricultural courses. "The scenario, however, has totally changed in the last two decades. Now the girls not only dominate in the numerical strength, but also perform better than the boys,” he says. Dr Jagtar Singh Dhiman, officiating Dean of Agriculture says, "Earlier, the study of agriculture was limited to boys, but now girls are showing better results in academics, and also secure good positions in the entrance examinations." Dr Gursharan Singh, Dean, Post Graduation Studies, informs that of the total students in the postgraduate courses, there around 56 per cent girls. With the objective to spread awareness among sweet-makers about the latest technologies developed by the Indian Council of Agricultural Research (ICAR) to improve the quality of sweets, a one-day interface on 'Milk Quality Assurance and Dairy based Health Foods' was organised here today. Fast, cheap and convenient methods for detection of adulterants in milk, food safety norms, increasing shelf life of 'khoya', and safe storage and transportation of milk were the major areas of focus during the interface organised jointly by National Dairy Research Institute (NDRI), Karnal; Central Institute of Post Harvest Engineering and Technology (CIPHET), and Halwai Association, Punjab; in association with National Agricultural Innovation Project (NAIP). Over 30 scientists from the NDRI informed the sweet-makers about various kits for detection of adulterants in milk. "This is the first time that such a large number of scientists from the NDRI have come to train sweet-makers outside their campus," said NDRI director Dr AK Srivastava. "Sweet-makers need to follow food safety norms and develop small ready-to-eat packages to cater to the present requirements. The NDRI has developed a number of low-calorie products, which could generate high demand from the health conscious consumers," he said. CIPHET director Dr US Shivhare said sweet-makers should focus on maintaining quality and should adopt the latest technologies developed by the ICAR institutes. He assured that his institute would provide all possible support to the sweet-makers. President of the Punjab Halwai Association Narinder Pal Singh lamented that they had no system for the detection of adulterants and the quality of milk. Terming safe storage of sweets as a major problem, he said they needed some technology to increase the shelf life of 'khoya’. Scientists from the NDRI gave presentations on rapid tests for detection of bacterial contaminants and adulterations, better shelf life,, dietetic dahi, and functional milk drink. Pakistan President Asif Ali Zardari’s sister Faryal Talpur, a member of the National Assembly, was in the city today. Faryal has come to India to offer prayers at Rauza Sharif-Dargah of Sheikh Ahmad Faruqi Sirhindi at Sirhind, accompanied by a delegation of National Assembly members. While in Ludhiana, the dignitary could not resist from visiting one of the famous women apparel stores on the Mall Road, which also has a special Pakistani collection of Punjabi “suit-dupatta”. “Pakistani suits have their own charm, be it on any side of the border,” she said. The vegetable prices are continuing to rise and are expected to soar further during the Navratras. According to the vendors, once the local crops including mustard greens arrive in the market, the prices will be reduced. Until then, however, during the Navratras and the wedding season, the prices will further rise. The College of Agricultural Engineering and Technology (COAE&T) of the Punjab Agricultural University (PAU) is all set to hold a two-day national seminar on engineering interventions and innovations for opportunities and challenges in Indian agriculture on October 4 and 5 at Jacob Hall of the university. Dr PPS Lubana, Dean, COAE&T, said the seminar aimed at bringing all stakeholders, policy makers, scientists and engineers on a common platform to deliberate on contemporary and futuristic issues for providing advanced farm solutions to Indian agriculture. He said that there was an urgent need for capacity building and also to explore the ways and means by which the agriculture and rural sector could contribute in a speedy economic resurgence of the nation, commensurate with its workforce and vast untapped potential. He added that the seminar would focus on various themes, including farm machinery for enhanced productivity and natural resource management; processing, preservation and value addition through novel food engineering techniques; and enhancing water use efficiency and irrigation systems management. The launching of "Prof Mason Vaugh Memorial Lecture" series will also take place on this occasion. Dr Gyanendra Singh, former Vice-Chancellor, Mahatma Gandhi Chitrakoot Gramoday Vishwavidyalaya, will be the guest of honour and will be delivering the inaugural lecture. Dr MM Pandey, Deputy Director General (Engineering), Indian Council of Agricultural Research (ICAR), will be the chief guest on the occasion. After a city resident levelled allegation of corruption against Municipal Town Planner (MTP) Raj Kumar, the Punjab Governor's office has forwarded the complaint to the Principal Secretary of the Local Bodies Department. In the letter, the Superintendent of Principal Secretary to the Punjab Governor has asked the Local Bodies Department to take necessary action. One Karandeep Singh, who is a member of People for Literacy, an NGO, has alleged that Raj Kumar was shielding those who were constructing buildings in violation of the bylaws. Karandeep alleged, “In the city, a number of structures are coming up in violation of the building bylaws. Instead of taking action against violators, Raj Kumar is minting money. By doing so, he is indulging in corrupt practices and encouraging violators," alleged Karandeep Singh. He alleged that Kumar had been charging huge “protection” money from the owners of illegal buildings by allowing them to go ahead with the construction. Karandeep Singh alleged that he had raised several issues regarding illegal buildings with the MTP, but no action was taken against the guilty. “Which is why, I was forced to write a formal complaint to the higher authorities,” he claimed. On receiving the complaint, Gurmeet Singh, Superintendent of Principal Secretary to the Punjab Governor, forwarded it to the Principal Secretary on September 27. “I have been asked to forward the complaint to your department for action,” read the letter. When contacted, MTP Raj Kumar refuted the allegations. “Whenever we come to know about any illegal construction, we take strict action against the owner of the building. Moreover, if any person has filed a complaint against me, truth will come out in the inquiry,” stated Kumar. The traders and industrialist of the town held a massive protest march against the e-billing, imposed by the Excise & Taxation Department, Punjab, here today. The protest was headed by Bharat Bhushan Jindal, president of Gobindgarh Steel Chamber of Commerce and Industry, Raj Bansal, vice-president, Mandi Gobindgarh Induction Furnace Association. While addressing the protesters the speakers said the motive of the government was not to check tax evasion but to harass the traders. The leaders said about five-lakh workers would be affected by the strike. The speakers demand the immediate withdrawal of the e-billing. The Punjab University Zonal Youth Festival Ferozepur-Moga Zone (A) started at GTB National College, Mullanpur Dakha, today. Manpreet Singh Ayali, MLA, Dakha, inaugurated the youth festival. While speaking on the occasion, Ayali announced to give Rs 31,000 to the college. He promised to give grant from his discretionary quota to the college. In his welcome speech, principal Dr Assa Singh Ghuman said the motive of the youth festival was to connect youth with the rich heritage of Punjab. As many as 14 colleges are participating in the youth festival. Traditional singing- RSD College, LR DAV, Jagraon (first), GN Colleg, Moga (second) ; kavishri- LLRG College, Dhudike (first), GN College, Moga (second), BKS College, Muhar (third) ; vaar singing- LLRG College, Dhudike (first), DM College, Moga (second), GHG Khalsa, Gurusar Sadhar (third). The long-pending demand of Khanna residents to set up the post of Additional Deputy Commissioner was conceded by the Punjab Cabinet on Wednesday. halka incharge, Khanna, Ranjit Singh Talwandi confirmed the development and said that they were jubilant. He said with the creation of the post, money and time of hundreds of persons, who had to go to Ludhiana for the redressal of their problems, would be saved.He said it would also help in development work in Khanna. Iqbal Singh, president of the nagar council, also expressed happiness over the development. A medical chck-up camp was organised by the All-India Senior Citizen Organisation in association with Bhagwan Ram Charitable Hospital at Sita Mata temple to celebrate the Senior Citizens’ Day. Members of the organisations said at least Rs 2,000 per month would be provided to senior citizens for medical expenses. Dr Mahesh Ludhianvi, vice-president of the organisation sang "Vrishth Nagrik Gaan" on the occasion. Charanjit Singh Atwal, Speaker, Punjab Vidhan Sabha, said development drive for villages would be taken up very soon.Villages would be provided safe drinking water, good roads and other basic facilities, he added. Atwal was in Doraha to distribute grant cheques to panchayats. The BJP Kisan Morcha will hold 'dharna' in the all capitals of the states on October 5 and will submit a memorandum of demands to the respective governors. Sukhminderpal Singh Grewal, national secretary, Kisan Morcha, Bharatiya Janata Party, alleged that the recommendations of the Commission for Agriculture Costs and Prices (CACPs), which said that the MSP of wheat was impractical was an anti-farmer stance. Nishkaam Kirtan Sewa Society, Mandi Gobindgarh, inaugurated its 28th training centre of cutting and stitching at Majra village on Wednesday. Society president Karamjit Singh said the courses would be of four months and would help girls to stand on their feet. He said the society was organising free camps without any government aid. He said the society was running 27 such camps in different villages. Purple Lines, Ludhiana, saluted the father of the nation on the 143rd birth anniversary. Jatinder Sahni, young entrepreneur from the city, discussed the ideology and philosophy of Mahatma Gandhi. He appealed to follow the path of peace and never to indulge in any kind of violence. Sahni asked to take a pledge to keep Mahatma Gandhi’s spirit alive by working for an impartial, secular India. Trident Limited was awarded the prestigious Birla Award for Human Resource Management in Textile Mills here on Wednesday. The award was presented to DK Mittal, location head, Budni, Trident Limited, by SV Arumugam, chairman, Confederation of Indian Textile Industry (CITI). District unit of Bharat Swabhiman Trust and Patanjali Yog Peeth, headed by Yog Guru Swami Ramdev, organised a dharna near mini-secretariat here on Wednesday. They were opposing the decision of the government, which allowed FDI in retail. Addressing the people, Krishan Lal Gupta, president, Patanjali Yog Samiti, Punjab, condemned the decision to bring FDI in retail and claimed that the move would completely ruin retailers, farmers and consumers. Shri Ram Sharnam Trust organised a blood donation camp in association with NGO Salaam Zindagi Foundation on Wednesday. The camp was dedicated to support the Thalasemic children. A total 102 units of blood were collected. Parveen Bansal, president of Ludhiana wing of the BJP, inaugurated the camp. Manjit Saini, president of Salaam Zindagi Foundation, thanked Shri Ram Sharnam Trust for assistance. The Northern Railways has nominated Dr Shiv Gupta, secretary general of the Anti-Corruption Council of India, as non-official member of the Zonal Railway Users’ Consultative Committee, which covers Punjab, Himachal Pradesh, Haryana, Jammu and Kashmir, Uttar Pradesh and Uttrakhand. Timber mandis will be launched at places like Balachaur, Dasuha, Hoshiarpur and Khasikalan soon under the Mandi Act. This was stated by H.S.Gujral, chief conservator, Punjab, while addressing a meeting of arhtiyas at Punjab Agricultural University on Wednesday. He said timber mandis should be started so that farmers and arhtiyas could be benefited. He said for the processing, trading and storage timber licenses would be provided by the Market Committee and a record would be maintained by the department. The Sidhwan Bet police has impounded five tractor-trailers, involved in illegal sand mining today. The police has registered a case against the drivers for illegally mining sand from the banned areas. The accused have been identified as Binder Singh and Gora Singh of Kothe Khajura village, Jagraon, Sukhdev Singh and Amandeep Singh of Gorsian Khan Mohammad village near Sidhwan Bet, and Sadhu Singh of Kurshaidpura village. According to ASI Jaspal Singh, the tractor-trailers were impounded on wednesday morning when some people were trying to smuggle the illegally mined sand. Earlier, the state government had banned sand mining around Sutlej river, following the instructions of the Punjab and Haryana High Court. However, despite the ban, some people are still involved in the illegal mining. Some time back The Tribune had highlighted the issue of mining in the area, following which Ludhiana Deputy Commissioner along with the officials of the Mining Department and the Police Department had launched a massive operation in the district several persons were arrested. Meanwhile, SHO Jangjit Singh, Sidhwan Bet, stated that the police was working with the Mining Department to keep a check the illegal activity. A 50-year-old woman, identified as Kulwant Kaur, a resident of Bhamia Kalan, was found dead in a field at Dehlon this evening. The dead body was spotted by a villager, who further informed the police. According to the police, the woman was killed with a sharp-edged weapon and her body was dumped in a field. An incident of road rage turned ugly after two employees of a local publishing group were thrashed by motorcyclists and their accomplices near K-Mall here this evening. The victim identified as Vijay and Gaurav, who sustained serious head injuries on the head, were rushed to hospital for treatment. An eyewitness said the duo was crossing a road when a motorcycle hit Gaurav on his leg. This led to a heated argument between the duo and the two youths riding on the motorcycle. The arguments turned into blows and accomplices of the motorcyclists also joined the fight. They assaulted Vijay and Gaurav with sharp-edged weapons, the eyewitness said. The security staff of the K-Mall had to intervene to save Gaurav and Vijay. On seeing the police, the assailants fled the scene. Gaurav and Vijay were rushed to hospital with serious head injuries. Unidentified thieves broke the windshield of a car that was parked at Furniture Market near the interstate bus terminus and stole Rs 40,000 and important documents today. The incident took place here this afternoon when Chander Bhan, a union leader, was visiting the market to purchase furniture. It is the second incident in the last five days. Earlier, thieves broke the windshield of a car belonging to a railway employee and decamped with valuables on Friday. A former school physical education teacher was allegedly thrashed by a group of students and their parents following a heated argument outside a school here today. The former teacher, who used teach at a school located in Kitchlu Nagar till few days ago, had resigned after the school authorities leveled allegations of embezzling of funds against him. Reportedly, the teacher, who is suffering from depression, was involved in a fight with a student during a recent school trip. A woman who was posing as a vigilance bureau officer was nabbed by the police here today. She used to extort money by threatening the teaching staff of anganwaris in Shimlapuri and Daba areas. She landed in the police net when she was visiting an anganwari center today. Police is still investigating the matter and is to register a case.